I am a Stay At Home Mummy. Score one for a nuclear statement and a sentiment that causes a frenzy in popular culture today. However, to say that I was a working mummy 30 years ago would have garnered the same reaction. Research shows that in 1970, 43 % of mothers, women caring for children under the age of 18, stayed at home. Since then, there has been a steady decline in these numbers. In 1999, a meager 23 % of women stayed at home to care for families. That said, in 2012 there was a slight uptick, where 29% of mothers categorize themselves as Stay at Home. Now, educated and financially stable women are more able to choose to leave the work place and have husbands or partners to support that decision. However, many women who stay at home today are single parents. They often belong to minority groups and have little choice but to stay at home, despite the financial challenges and lack of available support. While our older sisters campaigned, rallied and forged successful paths in the work world, it was not without a cost. This steep price was a devaluing of the benefits of the Stay at Home mother and increased pressure on women to work. 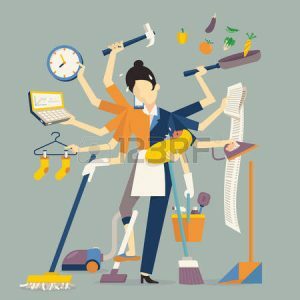 What was a welcome freedom at first, seems to have backfired, as women take on careers without being able to relinquish the care taking role at home. The total acceptance of the career and working mummy is still challenged, leaving us caught between the proverbial mummy rock and the proverbial mummy hard place. Inadequate policies and societal support often make staying at home a privileged choice. That said, in the work place, poor policies fail to support women, by limiting the flexibility needed as a mother, a wife and woman. Yes things are changing, but not quickly enough . As a result, we are bound by two emotions. Guilt is woven around our choices. What ever decisions we do make are generally perceived as being the wrong ones. Anxiety is guilts unwelcome side kick. Embracing being a mother, a wife, an individual with our own life either at home or out in the big wide world is fraught . ” Lean in ! ” “Lean Out! “Do the hokey pokey!” ” Turn About!” There is always someone on the sidelines with an opinion counter to our circumstances, choices and the lives we lead. We collectively question the decisions we make, but as there are no right answers, we turn on each other as we search for our own credibility. I realize how lucky I am. I met the hubs later in life, when our careers were firmly established. This allowed us to make a choice for me to stay at home to raise the boys we went on to have. I realize that with our age and stability comes a certain gravity that I would not have been able to enjoy in my 20’s or 30’s. I am not in the business of decrying other womens’ choices to work. 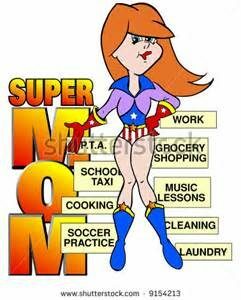 I am a Stay at Home Mummy and relish every minute, but love that many of my friends have a brilliant handle on motherhood and a professional life, balancing all their hats brilliantly. What I would like to accomplish here is to get us to think. As mothers, wives and women we have the opportunity to support each other in our choices, to be kind. We are indeed all fighting a hard battle. The hand that rocks the cradle does rule the world, just as much as the mummy in heels doing the school run before a 12 hour surgery shift, or a grueling day in court, or for that matter, holding down two minimum wage jobs to put food on the table. For those women who do not have the benefits of stability and education, we need to reach out and offer support. We need to lobby for better pay, flexibility and options in the work place. We need to lobby for greater opportunities for women, regardless of their backgrounds and education. We should lobby for more support for women at home so that being a Stay at Home mother is as respected as any other career. Our choice in how to raise our families should be just that and should not be hindered by guilt, anxiety and the unspoken limitations that we and society dictate. Whether we work inside or outside the home we are mothers, wives and women. This accords us superpowers. We just have to use them wisely … all for one and one for all! Well said. I love the fact that you are able to appreciate mums in all walks of life and varying situations. I am lucky that I am able to work part-time & therefore balance the financial necessity with the emotional needs to bring up my girls. I am too aware of the difficulties of those mums needing to work but who don’t have the financial and emotional support. Those who need to work but in term time only so that they can bring in a wage to put food on the table but to be there during the holidays so as not to incur extra financial burden. All too often this is because their husbands have buggered off to live the life of Riley elsewhere & henceforth relieve themselves of the emotional and logistical act of juggling family life. These are the women who desperately need attitudes and workplaces to change to help them without judgement. We are where we are for our own reasons, but let us not judge others for where they are or what they do. Support each other in times of need and be there for much needed fun and escape time. Go mummies! Thanks so much Tara . It is indeed all about our mummy village of likeminded and supportive women at home and in the work place.